It has been a phenomenal year for Sonoma County’s economy. Joblessness is below 5%, home values are soaring, and the treasury enjoys a record surplus of more than $13.5 million. The recession and cutbacks of four years ago are fading from memory, with one notable exception: Sonoma County Library system, one of the most beloved of public resources, has been left behind. Sonoma County has a reputation as a progressive community that values education and public space. But despite population growth and ever increasing usage, our 11 major libraries are now open only 40 hours per week, due to a 25% cutback in hours, from 52 hours per week, in 2011. County libraries were open 70 hours a week in 1981, when the area was far less prosperous. 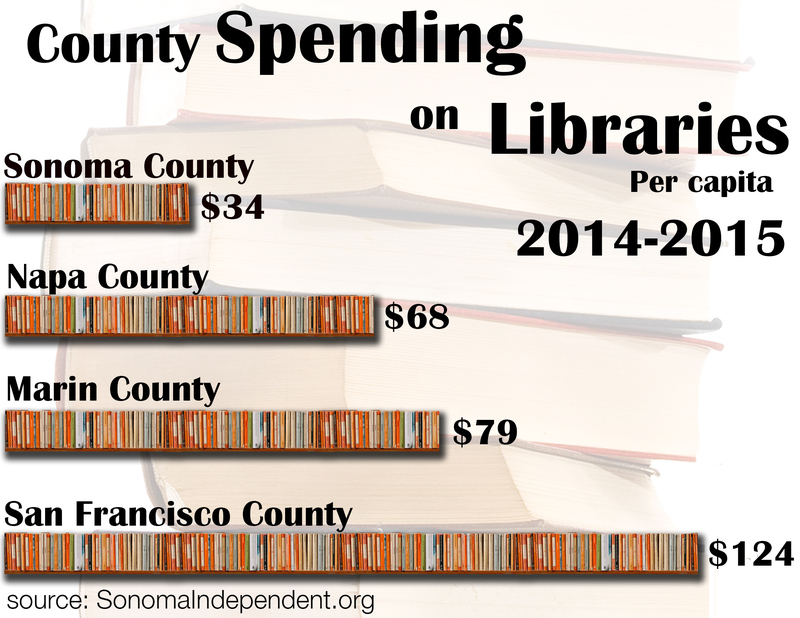 This year, Sonoma County will spend just $34 per capita on libraries. That’s half of what Napa and Marin County spend, and barely one-quarter of the $124 per capita that San Francisco spends. In June, Sonoma County’s Supervisors plan to vote on a budget for the next fiscal year starting July 1 that will add more than $6 million from the current record surplus to the County’s $40 million “rainy day” reserve fund. Reducing that contribution by just $1.2 million will barely impact the progress to the $60 million that the County eventually wants to keep available for emergencies. But it would reopen all libraries on Mondays, and start to resolve the largest funding crisis in County library history. This seems like a reasonable and urgently needed action for library users, especially parents, grandparents, educators and seniors, who have been experiencing what feels like a “rainy day” of cutback hours for the past four years. 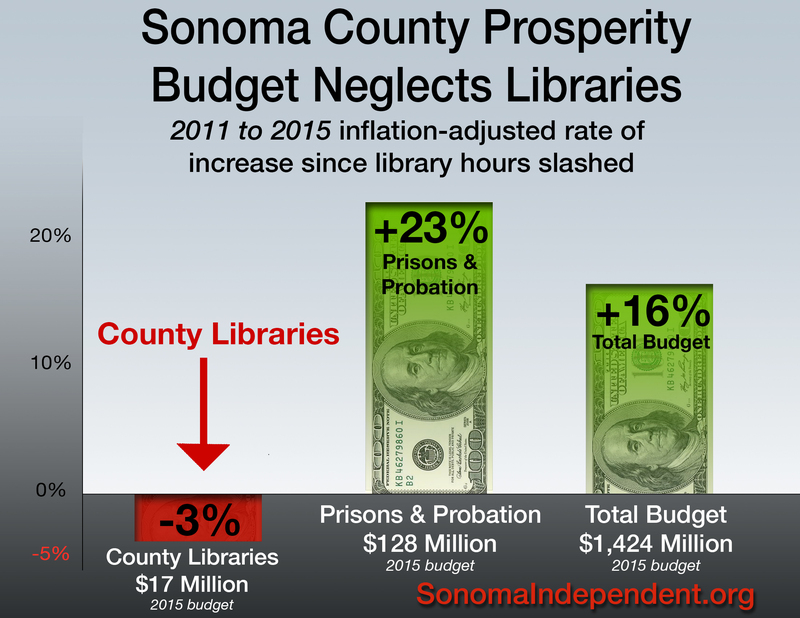 Yet when contacted by the Sonoma Independent during the past month, not one of the five members of our Board of Supervisors, elected to oversee the County’s $1.4 billion budget, has been willing to support allocating reserve or surplus funds to restore library hours. The JPA is the Joint Powers Agreement, the understanding between cities and the County as to how the Sonoma County Library system is funded through a dedicated parcel tax. A revision of the JPA, surprisingly, makes it nearly impossible for cities to assist in funding their local libraries. And because of a state law that dictates that a dedicated tax like one for libraries needs a two-thirds majority to pass, while other agencies could pass bonds with a 55% vote, or general taxes with just 50%, last November’s Measure M sales tax for libraries was defeated, despite winning 63.5% of the vote. Library Commissioners are now considering a new additional parcel or sales tax ballot measure in 2016 to assist the County’s underfunded libraries. Even if successful, this measure would not restore cutback hours for at least two years. Yet the three Commissioners contacted for this article all refused to comment on requesting funds from the Supervisors to alleviate the shortfall in the interim. It seems that everyone in our community, from the Supervisors to Commissioners to tax-paying citizens, feels powerless to even suggest that anything v=can be done to resolve the cutbacks this year or next. Yet there is nothing to stop the Board of Supervisors from adding funding for libraries, as the petition on the right side of this page, already signed by hundreds of taxpayers from across the County, suggests they do. Sonoma County’s budget surplus is projected to grow even larger next year. And the Board regularly adds funding from its General Fund for services that dedicated funding is typically pays for, like roads and law enforcement and early education and marketing public health ads on local public radio. Thousands of Sonoma County taxpayers have signed petitions to restore Sonoma county library hours. The most recent petition, from Informing to Empower, the parent non-profit of the Sonoma Independent, has more than 1,100 signatures, and can be signed on the right side of this page. More than 120 signers have added personal appeals and comments to our Supervisors. To give voice to the expression of our community, The Sonoma Independent has created a ‘Citizens Speak Out” feature that gathers more than 120 comments from scores of signature pages and puts them on one web page that can be read here. As Sonoma Independent’s chart below shows, during the four years since the Monday closures in 2011, the total Sonoma County budget, when adjusted for inflation of 5%, has increased by 16%. During this same period, inflation adjusted library spending decreased by 3%, to $17 million. Meanwhile, despite declining crime rates, inflation-adjusted spending on prisons and probation during the same period (boosted by state prison “realignment” funds) has increased by 23%– more than $26 million annually, to $128 million. The funding crisis in Sonoma County library history has translated into a 22% reduction in library attendance since 2011, meaning 600,000 fewer visits each year. Monday and evening closures have locked out tens of thousands of patrons: toddlers, teens, parents and seniors who had relied on regular library service. Library visits, with free Internet service, book and DVD lending, in a free, safe working space for all, were high until cutbacks caused them to plummet. Cut back hours have created lines for computer usage, and reduced services for the more than 100,000 citizens who use the libraries. Jonathan Greenberg writer disclosure: I have two young children in Sonoma County who are enthusiastic library users. As the founder of the Campaign to Restore Library Hours, I have helped a grassroots effort for nearly four years to secure funding for the restoration of library hours. This has included articles, commentaries, work on Measure M, two past MoveOn petitions and the current one on this page.